World War 2 saw the destruction of over 200,000 houses from the effects of bombing throughout the country, with a further 250,000 damaged beyond repair. Many families had been left homeless, often moving in with friends or relatives or being billeted by the local authorities with strangers. By the end of the war there were hundreds of thousands of displaced people living throughout the country. Only about 19,000 new homes had been built during the war, hardly sufficient for the natural increase in households, let alone the ones who were now displaced. The Housing (Temporary Accommodation) Act was passed in 1944, envisaged by Winston Churchill, the then Prime Minister after the Burt Committee was set up in 1942 to investigate solutions to the predicted housing shortage after the war. This led to the eventual building of just over 156,000 prefabricated buildings between 1946-1949, or prefabs as they were affectionately known. Despite this, there were still several families living in cramped, crowded accommodation often sharing one or two rooms between them. During the summer of 1946, many of these families took the situation into their own hands, and the Squatters Movement was born. Throughout the country there were hundreds of now unused military bases with plenty of accommodation often comprised of nissen huts. The movement began quietly on 8 May 1946 when a cinema projectionist, his wife and four children moved into the officers’ mess of an abandoned anti-aircraft gun site near Scunthorpe, Yorkshire. They were later joined by 20 more families and the movement spread to further camps in Scunthorpe then on to Sheffield and Doncaster. The family had been living in a four roomed cottage in Brandesburton before the owner needed it back, after which they lived in a cramped caravan that was not water tight and not suitable for a family of four. There was no water laid on and the electricity had been shut off, but the hut was clean, painted and secured against the weather. Squatting was becoming commonplace as the summer moved on with more and more families moving into abandoned nissen huts. In Chalfont St Giles, Buckinghamshire, one ex-commando John Mann who was sharing a small unsanitary cottage with his wife, young son and several strangers overhead a Polish captain say that the deserted army camp at Vache Park was to be readied for Polish soldiers. At dawn the next morning Mann and a few other homeless veterans seized Vache Park and by the next day, over 100 families had moved into the abandoned huts. British Pathe made a film about the Squatters town in Chalfont St Giles, a copy of this is available to view on youtube and shows some of the women and men being interviewed as well as a ‘town meeting’ where residents got together to hash out problems. The majority of men who had moved in were ex-servicemen and this is pointed out in the film by the interviewer. This mass squatters’ movement helped thousands of families find accommodation in the early post-war years before the prefabs were available and before new houses (both council and private) could be built to rehouse those displaced by the war. Where are they? The frustrations of hitting a brick wall in your reserach! One of the most frustrating things about being a genealogist is not being able to find an ancestor’s birth or baptism. Often these ‘brickwalls’ can be very frustrating, both in our own ancestry and for those of us who are professional genealogists, there’s nothing worse than having to tell a client you can’t find their ancestor/s. So how can we break down those brick walls? Sometimes it’s just a matter of attrition, searching through parish registers in the area you know your ancestor was from and working outwards from there. Where was the last place you located them? Are they on the 1851 census? If so, that’s great as it will give their place of birth, but be warned these are not always accurate, my great great grandfather William Singleton born in 1836, gives three different places of birth on different censuses, in 1851 he gives his place of birth as Muncaster in Cumberland, in 1891 as Ravenglass in Cumberland and in 1881 & 1901 variations on Low Eskholme (Low Escombe and Low Estham). In fact, these all turn out to be the same place, Low Eskholme is a farm in the parish of Muncaster & Ravenglass is the nearest village to the farm; so you can’t really take the information they provide on the census at face value! Thornage was a small village some 6 miles south west of Kelling, and until I found this entry I was unaware that he had been a widower. Unfortunately I didn’t find his baptism in the parish register for Thornage, but after a bit more research, I did find his first marriage to Martha Chapman in 1798 in Corpusty, Norfolk, which gave his parish as Briston, further south than Thornage, and I finally found his baptism in Briston in August 1773, breaking down one of my long held brickwalls. This gives a rough year of birth for Rachel as 1735, giving a time period to start searching for her birth/baptism. She was married in Kilnsea, East Yorkshire in 1766, a frustrating both of this parish, or botp. Israel himself was buried in 1785, a full 34 years before his wife dies, however neither were born in Kilnsea or Easington. 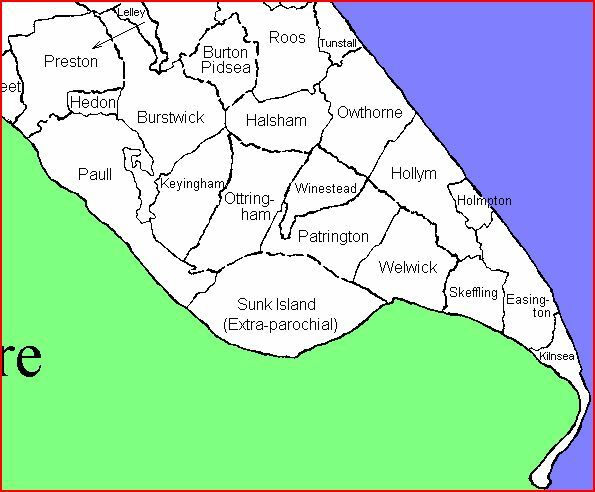 Working from here, I downloaded a copy of the parish register map for the East Riding available on http://www.genuki.org.uk and started working my way out ward from Kilnsea/Easington to cover the parishes of Easington, Hollym, Roos, Owthorne, Winestead, Patrington, Keyingham, Ottringham or Halsham: all to no avail, to date I haven’t found either Israel or Rachel, but I do know where they weren’t born! And that’s where the negative positive result comes in! It’s a negative result in that you haven’t found the ancestor you were searching for; but it’s a positive as well, as you now know where they weren’t born! If that makes sense. The thing to remind yourself as you ponder the growing lists of parishes you have searched through is that they must have come from somewhere. Another good source of information can be wills. Though it’s less likely that our Ag Lab ancestors left wills, sometimes they did, and sometimes they name cousins, or siblings, whose births/baptisms you can find and which allows you to extrapolate where your ancestor fits in, even if you don’t find their actual baptism. Wills can also tell us about family dynamics, and may mention relatives from outside the county, this could point to where your ancestor was originally from. Of course, there is always the possibility that they were not recorded in the parish register where they were born; were they non-conformist? Or were they baptised in the local parish register and it’s no longer available, sometime in the last couple of hundred years its gone missing. Sometimes, these missing registers can be reconstructed from the copy that was sent to the Bishop, known as Bishop’s Transcripts, these sometimes include baptisms that weren’t in the original register, that weren’t for some reason copied into the parish register, but were copied to the Bishop, and sometimes neither copy remains. Sometimes, just as you thing you’re never going to find that missing ancestor, a fellow genealogist or new found cousin will point you in the right direction, that’s happened with me a couple of times, an ‘oh by the way, did you know X was really from Y, not Z as previously thought?” can often send the researcher scurrying off in another direction. It’s difficult to remain positive when all you find are negatives, but keep searching, as you never know what you’re going to find that will push you in the right direction. There are many websites that I visit during my genealogical day and not surprisingly many of them are pay-sites such as Ancestry or FindMyPast; however, the first website I nearly always visit when researching a parish or an area is Genuki. It is a mine of information, and I don’t know where I, or many of my fellow genealogists, would be without it. As well as information on the whole of the United Kingdom & Ireland, it has a section for England, Scotland, Wales, Ireland, Channel Islands and the Isle of Man, and within each of these are sections for each county, area, or island within the wider area. My first port of call is usually the England Page, as most of the research I do is in England (though I have a large Scottish presence in my own family tree), and from that page you can access each individual county. You can see which links I use on a regular basis, as they’re a different colour than the others. Each county page includes a section on information that is related to the whole of that county, e.g. Archives & Libraries, Cemeteries, Census, Churches, Civil Registration, Gazetteers, Nobility, Occupations, Probate Records, etc. All of these are extremely useful. Colin Hinson is one of the Trustees of the Charitable Trust that is Genuki. Below that can be found information on the Churches within that parish, including photographs, the whereabouts and dates of the Registers for that parish, in Langtoft’s case they are deposited at the East Yorkshire Record Office; information contained within three directories, Baines’s Directory of 1823, Post Office Directory of 1857 and Bulmer’s Director of 1897; a map of where the parish appears in the East Riding and a link through to other maps, and information on which family history society covers this area. In all the information above is extremely useful to any genealogist or family historian. Especially the directories, which often include a description of the parish, along with a list of the prominent members of that parish. Knowing with record office keeps the various parish records throughout Yorkshire is invaluable, in such a big county, with several record offices, it’s a great way to track down where records are kept. There is a search engine which will search the whole of the Genuki website, so if you are looking for mentions of a particular place but are not sure which county it is in, then you can use the search engine and this will bring back entries for that place, e.g. is I search for Lantoft then I get back 143 responses, including the main entry mentioned above. I could extol the virtues of Genuki for a long time, but really the only way to get to know its contents is to go use it, browse it’s pages and enjoy it. I do, each and every day! 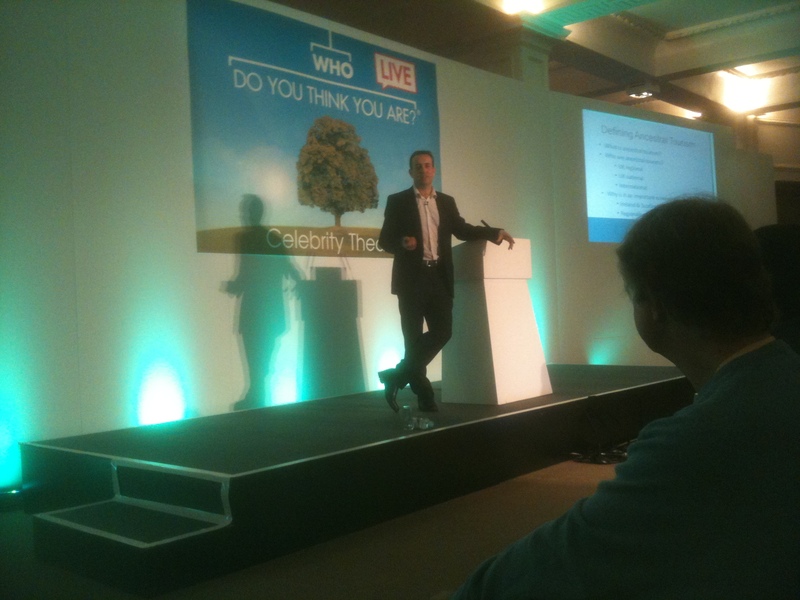 I had a great weekend last weekend at the WDYTYA Live show in London at Olympia. I arrived on the Friday afternoon and had a quick look around, but the main reason for getting there then was to catch up with people who I’d met on twitter and other social media; it was great to meet people and put faces to names. Had a great meal that night with some fellow professional genealogists and some good discussions on practising as a professional and our own family histories. On the Saturday I returned to have a good look around all the stalls and stopped by to say hello to a couple of people. I even managed to come away without buying any books, a first for me! I attended a couple of talks, this one was with Audrey Collins from the TNA talking about the replacement for the Catalogue there, it was very interesting and I look forward to seeing how this works out over time. 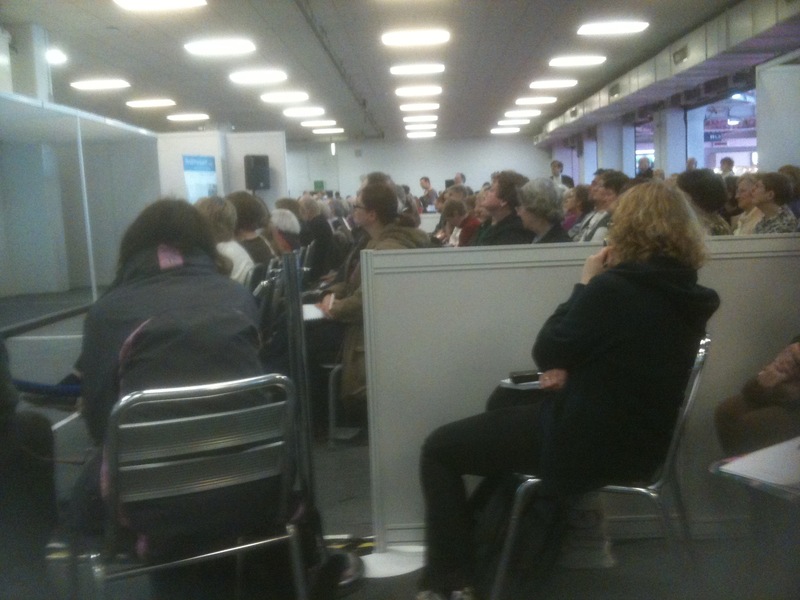 As you can see from the picture below, the talk was well attended. Saturday lunchtime and it was time to listen to Nick Barratt talk about Ancestral Tourism, there was a long queue for this talk, and we had to wait longer for it to start due to the previous session with Emilia Fox overflowing. Nick talked about the need to link in the heritage business to tourism in an area, citing the Scottish Homecoming even in 2009 and various initiatives in Ireland, he and others are talking to Visit Britain and other tourism giants on this. Saturday was the busiest day at the show, so much so that at lunchtime the only place to sit down and have a sandwich was the floor!! Sunday was a much quieter day and I only attending one talk in the morning given by Gill Blanchard on Writing your Family History, Gill had some good tips, some of which I’d already come across and some of which were new to me. After that I spent the rest of the morning in one of the coffee spots talking to other people I knew from twitter etc., before heading off to catch the train home. 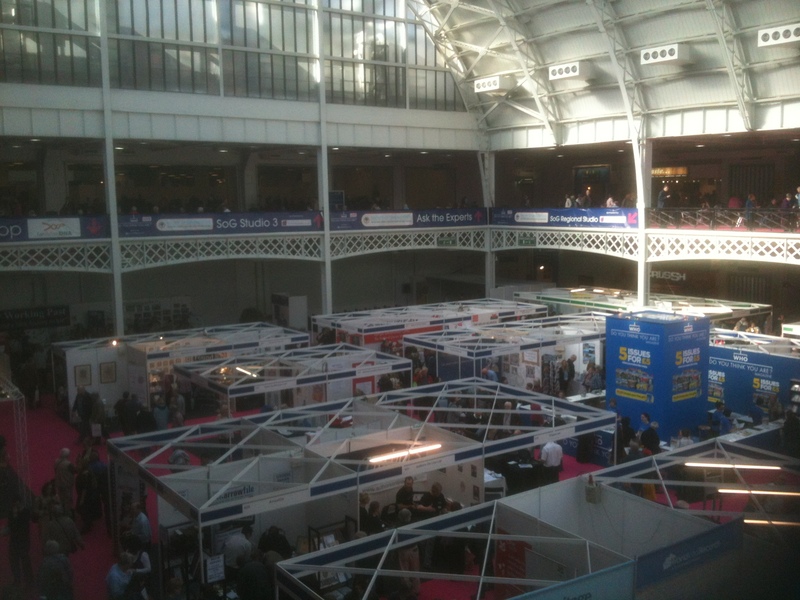 All in all it was a great weekend, I’m glad I went, despite the foot ache from walking to and from Earls Court every day. It was great to catch up with people and listen to some of the talks, the family history show side of things practically passed me by as I wasn’t interested in buying things I would then have to carry home on the train, but the social side of things was great! Not sure if I’ll go again next year, maybe the one after! When researching any part of the country, one of the first things I do is to look to see if I can find a historical trade directory, such as Pigot’s, White’s, Baines’ or from the mid-nineteenth century the Post Office Directories. The reason for this is the vast amount of information that can be found in a directory, from the history of the area, to its geology, population, sanitation, poor law union to entries for individual trades and people. The first directories began appearing in the late eighteenth century and were mainly at that time for the London area; in 1791 the Universal British Directory was published giving details of the trades carried on in various villages, towns and cities across the country. In the nineteenth century a plethora of directories were produced, with some published every few years and others only appearing the once. Some publishers sent out canvassers to collect information, some used existing listings of trades kept by the earliest registry offices and still others were by a small subscription. Whichever way it was done, these historical directories now give us a window in time to our ancestor’s lives. If we take the example of the Post Office Directory of Lincolnshire, published in 1868 published available on The Historical Directories Website, (http://www.historicaldirectories.org/hd/index.asp (NB, this project is now finished though the directories are still available to search); which has an introduction to the county, a list of the poor law unions and parishes within each, population tables, a list of Wapentakes, hundreds and sokes which help to place villages in their ancient places and a listing of Acting Magistrates for the County. But by far the most interesting information is within the detailed listings for each village and town. This example is for the parish of Dowsby in Lincolnshire’s fenlands. “Dowsby is a parish and village, in the Southern division of the county, hundred of Aveland, union and county court district of Bourn, parts of Kesteven, rural deanery of Aveland and archdeaconry and diocese of Lincoln, distant 4.5 miles south-east from Falkingham, 3.5 from Billingborough, and 7 north-east from Bourn railway station. 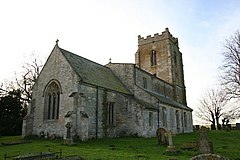 The church of St. Andrew, recently restored, is an ancient stone structure, with a tower containing 4 bells, and on the south-side is an entrance porch: the interior consists of nave, chancel, and aisles; the nave being separated from the aisles by a handsome stone arcaded colonnade: the church contains handsome pulpit, ancient font, a stained glass memorial window and a brass tablet to the memory of a deceased member of the Scales family; also several handsome tablet monuments, and one of a lady named Ashton, life-size, recumbent; there is an organ. The register dates from the year 1670. The living is a rectory, annual value £612 10s with residence, in the gift of Mrs Johnson, of Ryhall and held by the Rev Kingsman Basket Foster, B. A., of Lincoln College, Oxford. A school for boys and girls is endowed by a Mrs Burrel, deceased: the building is new, and adjacent to the church. Dowsby Hall, a fine Elizabethan mansion of stone, erected in 1630 is now the residence of Mr Seth Ellis Dean. 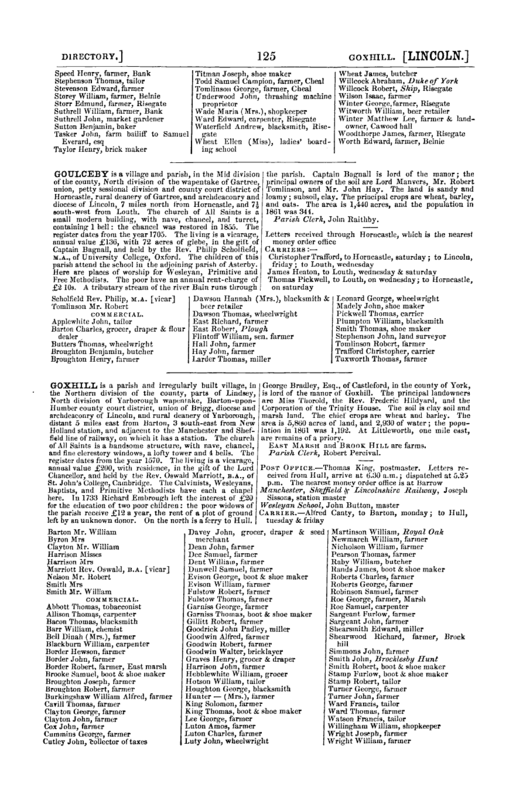 Edward Nathaniel Conant, Esq., of Linden, Uppingham, is lord of the manor. The principal landowners are Lord Aveland, Mrs Deeker, Richard Lucas and Edward Nathaniel Conant Esqrs. The soil is loam; subsoil clay. The chief crops are wheat and oats, and pasturage. The population in 1861 was 195; the parish contains, including the hamlet of Graby, 1,809 acres. Dowsby is situated on the western extremity of the Fen district, or the low country. DOWSBY DECOY is about one mile east. Graby is about one mile to the north-west; and the portion of the hamlet in Dowsby parish is called East Graby. West Graby is in Aslackby parish. Letters are received through Falkingham. The nearest money order offices are at Billingborough and Falkingham. There are several things that we have learnt about the parish of Dowsby from just this short paragraph in the Post Office Directory. We know that the Rector Kingsman Foster went to Oxford, we know the name of the Lord of the manor, we know that Thomas Wilkinson was not just the parish clerk, but also the school-master and collector of taxes and we also know that the main trade carried out in this area was farming & grazing, that there is a mill, a grocer & beer seller and a boot & shoemaker. More than just that though, we know that Dowsby has a particularly beautiful church, St Andrew’s is described thoroughly and it is easy to imagine my ancestors who lived in this parish coming to the church to be baptised, married or buried there by the Rev. Foster. They were agricultural labourers and from here I can see that there are at least five farmers in the area who they may have worked for. Did they buy their groceries from William Taylor or get their boots mended by Benjamin Taylor, did their children attend the school? From here further information can be sought, where was Dowsby Hall, does it still stand today? Who was Seth Ellis Dean, Henry Casswell, John Claypole – all these people were my ancestors’ neighbours. Additional information added for Gosberton included details of the Post & Money Order Office, Insurance Agents and Carriers, along with the list of commercial entries where again many of them are for farmers. Here also are other trades, such as butchers, druggists, bricklayers, blacksmiths, carpenters etc., a much wider variety than that for the smaller parish of Dowsby. Directories are available in many local history libraries as well as record offices or archives, look for them on the reference shelves. 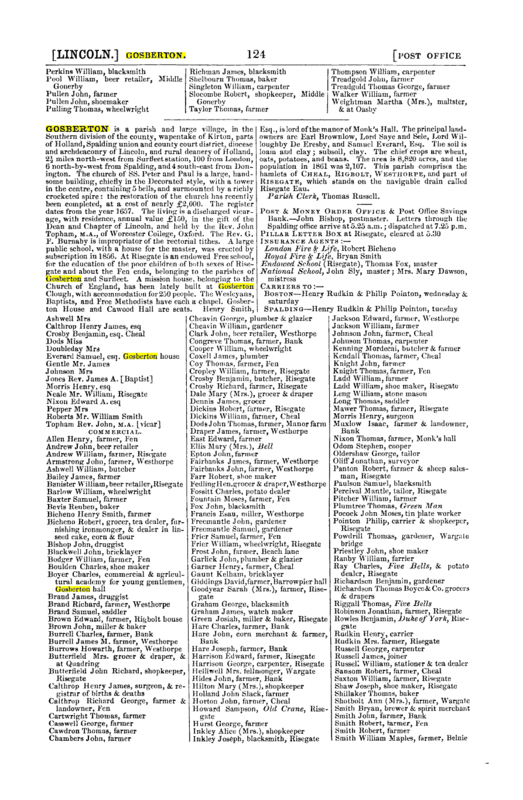 Online directories can be found in several places, as mentioned above the Historical Directories, http://www.historicaldirectories.org/hd/index.asp website has a wide selection for each county; http://www.ancestry.co.uk/ has directories in its UK, City and County Directories database, some can be found on Google books, and others are available for sale on CD. All are worth searching through for background social and local history, you may not find an ancestor in these directories (though somewhere along the line, most people do), you will however find out about their village, church, neighbours etc., it is possible to build up a picture of their daily lives using this directory and others like it produced throughout the nineteenth century. Working my way through the parish register of Burton Agnes at the East Yorkshire Archives in Beverley this week, I came across a couple of entries that provided a lot more information than the usual entries up to that point had. These were all signed by William Dade Rector of Barmston, two baptisms in October 1784, three burials Oct-Dec 1784 and a marriage on the 6 October 1784. I smiled to myself as I had come across ‘Dade’ register entries before and you’re always lucky when you find one as the information provided can take you back another generation, and often point to a different parish. I wondered what William Dade Rector of Barmston (near Bridlington) was doing in Burton Agnes that winter of 1784. The answer lies in the fact that William’s brother Thomas had lately been made Vicar of Burton Agnes and both the brothers had been born there, their father Thomas Dade (1718 – 1759) having been Vicar of Burton Agnes himself. I can only assume William was looking after the parish for his brother until he could move from his previous parish of Middleton in Teesdale to take up his duties in Burton Agnes. So much information contained in one baptism entry, we have Archibald and his parents James & Lucy, his paternal grandparents Archibald Christie and Ann Gordon (whose brother Alexander is also mentioned) and his maternal grandparents John Beardsley and Mary Neale. Not only that we know that his paternal grandfather is from Inveresk in North Britain (i.e Scotland) and his maternal grandfather was an attorney at law. What a goldmine for any Christie researcher out there. You have to wonder what John Hodgson had done to get him and his wife Mary incarcerated in the Castle that their daughter Charity was born there. We learn that John is a labourer of Lutton near Malton, his father Thomas is a weaver, his wife’s maiden name was Beeles and her father is from Hunkleby near Pocklington and he too is a weaver. Again by finding the baptism of Charity we find her paternal and maternal grandparents. (Addendum Quarter Sessions for East Riding shows a Mary Hodgson of Lutton wife of John Hodgson of Weaverthorpe labourer, accused of theft of linen cloth at Weaverthorpe, which is a mile down the road from Lutton. QSF/254/B/3 c1771 So it looks like it was Mary who was incarcerated in the Castle). Here Ann’s parents are mentioned as Charles & Elizabeth Cawkwell, no mention is made of their occupation or of Robert’s parents, but from this I was able to find Robert Watson marrying Ann Cawkwell in 1803, I also know I need to go back in the baptism registers as Thomas was the second son of Robert & Ann. This one is a lucky one for me, Dinah was the only child born in Pocklington, I managed to trace Leonard to York where Dinah’s siblings had all been born. Finding this baptism broke a brick wall of several years standing, proved her last name was Hunter and took me back two further generations. Though it doesn’t name Leonard’s parents, it gives his wife’s parents names and from that I was able to find Elizabeth’s baptism in 1749 in St Maurice’s, York. However with the introduction of Rose’s Act in 1812, Dade registers came to an end, though some continued on for a little while afterwards, they soon died out. William’s brother Thomas Dade who was Vicar of Burton Agnes for over 20 years was obviously not a follower of his brother’s ideals, his entries in the parish register of Burton Agnes are brief to say the least! I can’t help but wonder if this caused a few discussions between the brothers as to which was the best way to record the information of these life events. William Dade died at Barmston in 1790 at the age of 50. As well as his work as a clergyman, Dade was an Antiquarian, and in 1783, he had been elected a Fellow of the Society of Antiquaries and he was working on a folio of the History and Antiquities of Holderness which he never completed before his death; this was considerably reworked and published later by George Poulson an historian in Beverley. Another project which he was working on was that of an “Alphabetical Register of Marriages, Births and Burials of considerable Persons in the County of York” in several volumes, I’m not sure if this was published. Obviously Dade himself had an interest in genealogy which would help to explain his interest in preserving family information for generations to come. So if your family history journey takes you to Yorkshire and you are lucky enough to find yourself faced with an entry with extra information, then you can thank this eighteenth century antiquarian with an interest in genealogy. I know I do.